Five Came Back is a fascinating documentary about five remarkable Hollywood film directors who put themselves in harm’s way to film World War II for the US War Department. William Wyler, Frank Capra, George Stevens, John Ford and John Huston were in many ways a diverse bunch, yet the all represented a different facet of “America”. Certainly, all were idealists who felt it was their duty to use their talents to create accessible propaganda for the US public and more importantly, the 12 million men who were drafted. Despite the factual accuracy of this three-part documentary, there is an inherent romance to the tale and the way these Hollywood mavericks took on first American Isolationism, then the Third Reich and US military politics. Narrated by Meryl Streep and based upon the Mark Harris Five Came Back: A Story of Hollywood and the Second World War, this Netflix documentary cleverly intercuts the story of these five legendary film makers, with soundbites from contemporary Hollywood luminaries, Steven Spielberg, Paul Greengrass, Guillermo del Toro, Francis Ford Coppola and Laurence Kasdan. It is here that the show excels itself, as these modern film makers clearly have a great deal of love and reverence for their predecessors and how they advanced the craft of film making. Greengrass, who comes from a documentary film making background is especially observant and analytical of John Ford’s urgent style. His genuine use of shaking footage, sprocket jumps and loss of focus has now become a mainstay of film makers trying to capture the authenticity he experienced. 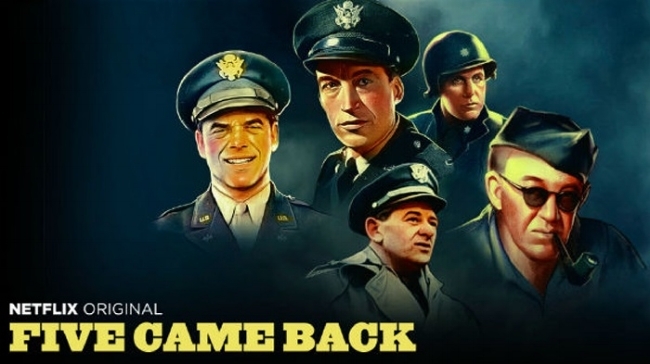 Five Came Back these focuses on how these directors changed the public perception of the war in the US. There personal heritage played heavily on their motivation and creative output. Ford was a traditional American conservative, where Wyler and Capra were both immigrants, yet they all clearly saw the threat of Fascism and wished to contribute to the war effort. It was the fact that they were all old school film directors that gave them their specific edge. They were natural leaders, autocratic and skilled in marshalling logistics and people. George Stevens made films for the US Army Signal Corps and William Wyler made documentaries for the US Air Force. Frank Capra, was tasked with creating the documentary series Why We Fight to boost US troop morale. His master stroke was to take Leni Riefenstahl’s Nazi propaganda film Triumph of the Will and to lampoon and satirise it, making it look foolish and puerile. Five Came Back explores the nature of propaganda and how cinema and newsreels played a key role during World War II. Over half of the US population went to the movie theatre every week and so the medium became the logical means to convey information and boost morale. Wyler, Ford, Capra, Stevens and Huston all experienced war via some of the most ferocious campaigns. North Africa, the landings in Southern Italy, D-Day and the Battle of Midway. They produced films that still pack an emotional punch today and each came home changed men. Curiously enough it can be argued that their personal experiences fuelled their finest work. Consider Shane (1953), It’s a Wonderful Life (1946), The Searchers (1956), The Best Years of Our Lives (1946) and The Treasure of the Sierra Madre (1948).